An immersive + intensive coaching 3-day weekend fully focused on your life and your business, that will help you take a step back, clear out the crap, uncover your core desires, reignite your fire, and map out a magic activating action plan to bring it all to life! JOIN THE WAITLIST & BE FIRST TO KNOW WHEN NEW DATES ARE RELEASED! Most people think that in order to see the results they want they have to work harder and do MORE, but I’m here to show you the opposite is true. Because it’s time for you to take things to the next level. The level that doesn’t involve you getting so caught up in the day to day of ‘doing’ that you forget what you’re even working for. The level that doesn’t see an anxious whir in your stomach when certain clients drop into your inbox. A level that doesn’t see you only having a break when you’ve made yourself so tired, exhausted or ill that you physically have to lie down. I know that you want SO MUCH MORE. That you want to soak up every inch of your life on the planet. That you want your business to feel jump-out-of-bed-juicy. That you want to live your fullest life and give back to the world. You’re tired of feeling like it’s all a struggle. You’re tired of feeling like all you ever do is think about your bloody business but still aren’t seeing the results you want. You’ve forgotten what you even enjoy about it or your life anymore. You want to get the soul, the passion and the magic back. And what if I told you that once you tap back into *that*, things get wayyyyy easy. Why shouldn’t you have the things you want? Money in the bank. The freedom to travel. Work you adore. Clients that feel like friends. A home of your own. To be in demand & well-known for your work. A creative business owner with a passion. Or at least, once upon a time you were. Recently, you’re in need of a super-boost style recharge and reminder of why you’re doing this damn thing in the first place. You want to get refocused with an on-fire desire for your vision. You want to believe in yourself and your big incredible life, because you’ve lost sight of what you’re truly capable of. You want to live bigger and with more love and ideally, more money in the bank. You want to be surrounded by awesome women with incredible things to say. You want to be a part of the connection and conversation. You want to get immersed in HIGH-VIBES that’ll propel your business and your life. You want to take some time out to focus ON your business, instead of being in it. THE MAGIC ACTIVATION MASTERMIND - BREAKTHROUGH COACHING & STRATEGY - an immersive + intensive coaching 3-day weekend fully focused on your life and your business, that will help you take a step back, clear out the crap, uncover your core desires, reignite your fire, and map out a magic activating action plan to bring it all to life! What’s the vibe: Business Badassery & Magic Activation Hub. A 3-day experience where we’ll connect, vision, and get sh*t done. These 3-days are going to be a beautiful combination of dreaming big & making it happen. Think: immersive training on your mindset, marketing, money & action, 2 hours of devoted ‘action-taking’ a day (whether that’s on your copy, your website, brand-building, social media, package creation), delicious food, amazing company, and probably some kombucha-concoctions and angel cards. Think: crisp morning walks, transformative group discussions by the fire, notebooks and pencils and copious amounts of tea, quiet time and thought, deep coaching + private strategy meetings with me, evenings in the hot tub, time to recharge —and, of course, plenty of laughter, energy, and a way to reboot your enthusiasm surrounded by people who are motivated and in-the-know! This is for: Women striking it out on their own; entrepreneurs desiring creative new approaches to getting seen, women who are ready to sell themselves and their work with confidence and integrity. Those who are tired of hiding and want to magnetise their dream clients, and their dreams! If you’ve been running your business for a while but you’ve hit a block and are feeling underwhelmed, have lost sight of your vision, and need a power-injection of excitement to accelerate your passion, purpose, focus...and clients, this is for you! Flipping the switch on your mind so you can obliterate those blocks holding you back once and for all. Activate your confidence, map out your big dreams, and get realigned with the things you really really want, so you can feel on-fire excited and ready to do the damn things! You know it’s time to stop letting the fear of ‘what other people might think’ hold you back from your extraordinary, glorious life - so you’ll learn how to release those fears for good and get out of your own way in order to create the badass business & life you’re dreaming of. YOU HAVE SO MUCH EPIC TO SHARE. So stop wasting it and start reaping the rewards. It all starts with what’s going on in your head, let’s bust on through the lot! We go deep, so be ready to obliterate your self-sabotaging behaviour in a big way and unleash the power you know you’re ready to firehose into the world. Because talking about money should double your bank balance, not your stress levels. We’ll get to work on creating a plan of action to double and triple your revenue asap. We’ll explore your packages and prices right now, how to make sure they feel aligned and are meeting your desires, AND how to be making those sales, too. We’ll also be delving deep into your money mindset, your beliefs around your worth, and how to flip them so you’re earning the money you want consistently and feeling really damn good about it too. How to fix up your brand focus and know exactly who you’re talking to and what to talk about, create offers that your clients salivate over, and position your services so you stand out from others in your industry. You’ll have time to sit down and fully focus on what you’re saying about your brand, what you’re offering, and how to make it speak to the people you want it to speak to, with me by your side to give you in-the-moment feedback, guidance and direction. Prepare to leave with your message nailed and the confidence to share with the world! When I say magic, I mean it. This is about so much more than the day to day of your business. This is about dancing with magic, reconnecting with your soul, taking a look at what you’re truly deeply craving, and giving yourself permission to immerse yourself in the things that turn you on and light you up. WHEN YOU TAP INTO YOUR OWN MAGIC & MAGNIFICENCE, YOU MAGNETISE EVERYTHING YOU DREAM OF. So, who am I and how can I help you? I’m Sophie French, a life & business coach and speaker on a mission to help talented, creative, women like you to unlock and unleash their full potential. (Because I know you’re not even scratching the surface on what you’re truly capable of.) When you tap into your own magic and magnificence, you magnetise everything you dream of. I’ve trained as a Neuro-Linguistic Programming Master Practitioner, become a qualified Life Coach and built a thriving copywriting consultancy and coaching practice: which means I know my stuff when it comes to clearing out the pesky ‘can’t’ in your head that holds you back from your dreams AND sharing the compelling message that attracts your HELL YES clients. To date I’ve helped hundreds of women discover a confidence in themselves they didn’t know they had, to start rediscovering who they are, what they really dream of, and how to make it happen. My clients have quit jobs, started businesses (yes, plural! ), launched events, started their blog, began earning five-figure months, raised their prices and been fully booked, and booked themselves onto THAT dream retreat to Ibiza just because, and much more, because they’ve learned how to put themselves and their dreams first. And I’m here to help you do the same. What’s included in The Magic Activation Mastermind? A Facebook group of pre-mastermind training, where you get to know your business sisters and get fully equipped and prepped for our magic 2 days together. Private yoga sessions on the sea-view deck to help us tap into our magic on the daily! And champagne in the hot tub because: life! ME guiding you through the wonderful world of mindset, marketing, money and making things happen so you can activate the epic you’ve got to share. With a big dose of magic in there, naturally. 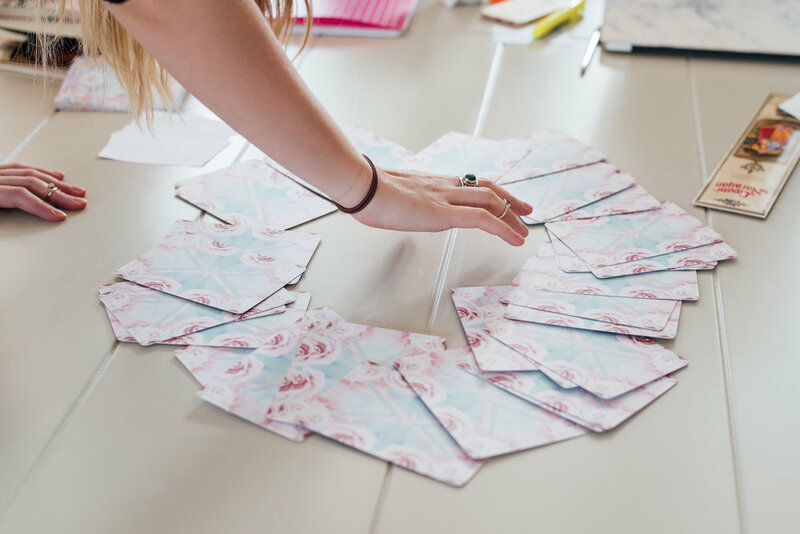 Masterminding alongside other business megababes who are on your awesome wavelength and get a turbo-boost of unshakeable confidence as we work through what needs to happen to get you visible in a BIG way! JOIN THE WAITLIST & BE NOTIFIED WHEN THE NEXT ROUND IS OPEN! GET MY SWEET TUSH ON THAT WAITLIST! Are you excited yet? I sure am! Your vision for the future you with a full calendar of dream clients, a brimming bank balance, full heart and glowing health stops being a dream and becomes an actual ‘I can freakin see this!’ hot damn reality with a master plan to bring it to life. You create a brand new way to run your business, cut-out your soul-sucking clients and earn double the dollar all while taking Fridays off. You uncover, understand and OWN your unique superpowers and feel oh-so-ready to share them with confidence with the world! You get clear on your compelling message that’ll hook your HELL YES clients! This is about business AND life. Because one’s blood courses straight through the other. When you’re on top of the world, shining bright like a diamond and feeling like Rihanna in her underpants - business booms, life feels blissful, and it all blends together into a cocktail of delicious. Ready to take the top down on the cadillac of life and cruise through with glee? JOIN THE WAITLIST + BE THE FIRST TO KNOW WHEN TICKETS ARE RELEASED FOR THE NEXT ROUND! It was magical, so much more than I even imagined. It was the most productive and self caring weekend I have ever had! While there’s so much safe space for opening up, it all felt so positive and energising. I loved every minute!! *Accommodation is not included but there are cute airbnb’s nearby that are suuuper reasonable - particularly because it’s low season. I’ll put you in touch with other guests in case you want to share, too! Got questions? Hit me up! If you’re the kind of gal who would love a quick cuppa and a chat before securing your spot, you can totally do that by dropping me an email to hello@sophiefrenchcreative.com. But be quick, cos’ these spots are going to get snapped up! If you’ve reached this point on the page, I know you’re craving more from your life. You want to rediscover who you are, what you really want, you want to live a life full of pleasure and fun and more of the important things. And you’re sick of being held back by the negative thoughts in your head. Can you imagine getting to the end of yet another year thinking: ‘I never did that thing I really wanted to do because I was afraid’? I don’t want that for you. I’m so incredibly passionate about helping you find the self-belief and unshakeable confidence in yourself that means you can be, do and have anything you want. It’s time for you to invest in yourself and your life. It’s time for you to live your full potential. It’s time to stop groaning about your day, and grinning about it instead. It’s up to you to take charge of your life, and you have the power to do so. I’m here to support you every single step of the way. Your life really is what you make it, and together, we’re going to make it an exhilarating experience you’re head over heels in love with. I totally get it. Investing in anything, especially on yourself (when you’ve probably forgotten what that feels like) can feel worrying. What I would invite you to think about is how much your dreams mean to you, and what will happen if everything stays exactly the same? Whilst it’s your personal decision to make, what I can say is that the work we do together in this immersive weekend is designed to blow your mind, boost your confidence, vastly improve your relationship with yourself and those around you and shift your lifestyle forever, and be FUN too - so does that sound like a pretty worthwhile way to spend your money? I’ve been there and I get it. You’re so used to caring for others or having your head down in the trenches 'doing the work' that focusing on YOU and the bigger picture isn’t something you’re used to. What I can promise is that you absolutely deserve this. Your life is precious, and it should be lived with joy, and you more than anyone deserves to feel great in yourself. It’s your time. As human beings, we are always resistant to change, because change keeps us comfortable. In order to get past this totally normal resistance, I’d invite you to ask yourself: which is more terrifying - the thought of change, or the thought of staying exactly the same and continuing in a spiral of self-doubt? I’m assuming it’s the latter, which means you’re so ready for this change, and I’m here to support you every step of the way.